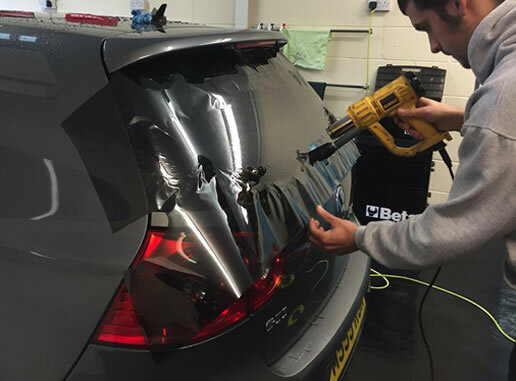 Yorkshire Tinting provide training in accordance with window film manufacturers Llumar and Global. We are accredited installers of both these superior brands of window film. We are able to offer whatever the trainee feels is necessary to accomplish there individual goals. If you want to learn the very basics or some more advances techniques, you have come to the right place. .An introduction into window films, how they are made and the law. .How to prepare the car and the glass. .Cutting templates for different types of window, i.e. Roll downs, fixed panels etc. .One piece rear window shrinking and installation. .Installation of film to the glass without contamination. .A look into marketing and approaching dealerships. .An introduction to Architectural window film application. We work in a real environment, on real cars to give you the confidence to go out and do it on your own. We offer continued support should you face a problem on a particular vehicle, and we also offer you the opportunity to come see us for a day and work along side us to give you the chance to see what you are paying for. We have trained some high caliber window film installers and all of them have gone on to build a successful buisness.